Got thinning hair? Now we know why! All types of mammals experience hair thinning as they age. Ugh. In both sexes, it’s thought to be caused by shrinking hair follicles. But stem-cell biologists in Japan weren’t content with shrinkage as an answer. So they decided to study the stem cells that develop into hair follicles. They began by observing hair loss in mice as they aged. At various times, the team took skin samples to look for activity in genes that maintain hair follicles. What they learned? Almost hair-raising. 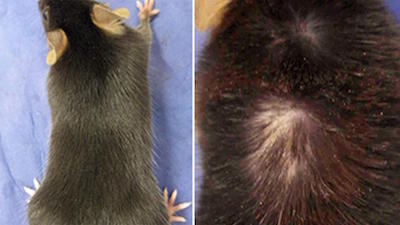 As mice aged, their hair-follicle DNA also got a bit, shall we say, scruffy. The damaged DNA led to the destruction of a specific collagen protein. And as follicles became less and less able to make this collagen, they shrank. Hair thinned. But here’s the kicker: Eventually the follicles turned from hair cells into skin cells! Crazy! When they studied human women of all ages? Same thing. Just think of it this way: You’re not losing hair, you’re gaining skin! Not better? Sorry.